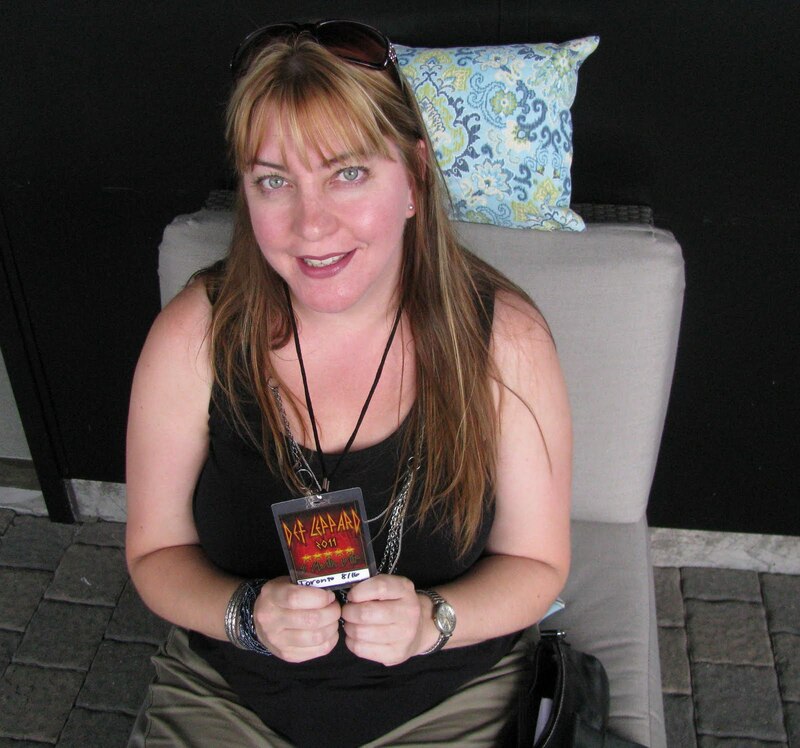 Me at Def Leppard's 2011 Mirror Ball Tour. So last night I did something I have never done before, I went to a concert by myself. Brian, the friend I usually go to concerts with was away on vacation and Rob works nights and isn't really a fan of Def Leppard anyway. When tickets went on sale I knew Brian was going to be away and decided that I wasn't going to go this time. We had did the ILoveAllAccess thing in 2009 when they were here and had a great time. As time for the show drew nearer, the more I wanted to go, so I bit the bullet and bought the 5 Star VIP package from ILoveAllAccess again, this time alone. Registration was at 4pm, so I left work early, went home, got ready and took a taxi down to the Molson Amphitheatre at Ontario Place. Lots of people doing the VIP package were there so I chatted to a few people but mostly waited alone. When I got my envelope I was kinda nervous about what ticket I was going to get, Brian and I had scored 2nd row, but he had bought our tickets the day they went on sale. I knew I was guaranteed a seat in the first five rows, but closer the better, right? I was pretty happy when I saw I had scored 2nd row again! My VIP pass and a drink, perfect combo! We were taken to the lounge/bar off to the side of the Molson Amphitheatre stage for our private pre-show party from 4pm-6pm. After 6pm other concert goers would be allowed in too. There was food and drinks, and we were given our swag bag. There was also a raffle with lots of Def Leppard items being given away, the top prize being a Pyromania CD, that Helen, our hostess would accompany you backstage before the show to have the whole band autograph. I met some nice people back there to hang with and texted Rob that I was hanging out with a bunch of hot women and that he should of come. Look at me hanging out with a bunch of hot women! I almost look like I fit in. Always good to run into old friends. This is Harrison from my Club 279 days, he always made sure I got home safe and sound. The cooler damage! I do love vodka coolers. You know you've had enough to drink when you start taking pictures of your foot wear! 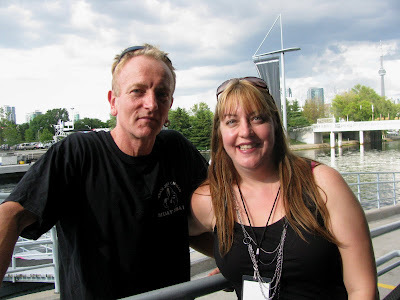 I also had a nice chat with Helen, who was the hostess in 2009 as well, but is now also Phil Collen's wife. Phil is one of the guitarists for Def Leppard, just in case you don't know. Helen, our hostess, and myself. Turns out, a picture from the 2009 show that I had posted of them on their FaceBook fan page earlier yesterday, that they both saw and discussed, was the first picture ever taken of them together, they weren't even dating yet. But obviously the attraction was there, they started dating about 2 weeks later she told me!! My "eagle eye" noticed Phil walking by at one point, and I called to him and he came over. I was telling him what Helen had told me and he gave me a high five. He started to draw some attention of others in the lounge when he posed for a picture with me, and I said to him. "oh, oh, I'm going to start a commotion aren't I?" to which he replied, "yes, you are going to start a commotion" LOL!! Actually, it was him causing the commotion, and when others started walking over to talk to him and ask for autographs and pictures, he was too gracious to turn them away. Hence the funny look on both our faces in the picture below, I'm trying not to laugh as he sees the crowd coming for him! Now, on to the show! I made a conscious decision before the show even started that I wasn't going to take a lot of pictures. I didn't want to be watching it through a lens trying to get "the perfect shot". 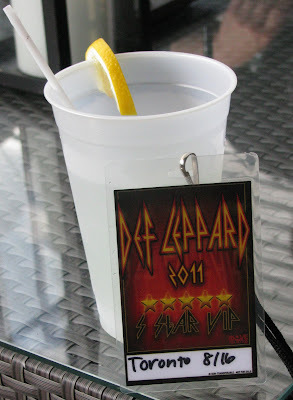 I wanted to get lost in the music of Def Leppard, that has been a friend to me for over 30 years. I took a few pics of both Heart and Def Leppard, mostly at the very beginning. Below are the few pics that I did take. The Wilson sisters of Heart, Ann and Nancy. Def Leppard guitarist Phil Collen. Def Leppard's lead singer, Joe Elliott. Def Leppard bassist Rick "Sav" Savage. Def Leppard guitarist, Vivian Campbell. My very blurry picture of Rick Allen, Def Leppard's drummer. This had the potential to be a great shot. My friends Teena and Gord were at the concert as well, she won tickets! She took more pictures of the show then I did, and did a nice blog about the show. All in all, I had a great night. Would I have preferred to go with someone? Yes. Would I go solo again? Absolutely! Wow, sounds like you had a great time! I love the story about Phil and his wife and your picture!! Looks like you had a grand time! I looked for you!